Runtime is handled by Docker. You don't need MAMP / XAMPP, local installation of Selenium, etc. Common tasks are automated via npm scripts, for example, npm run build. If you're not familiar with Docker, this is great quick start. We also have some tips for you. npm config set script-shell "c:\Program Files\git\bin\bash.exe"
See also Windows tips below. Have a ☕, this will take a while. Tip: From time to time, it's useful to clean up everything and pull latest Docker images. Run npm run refresh-dev. Make sure Docker is running and ports 80 and 3306 are free (no local MAMP / XAMPP / MySQL running). VersionPress source files are directly mapped to the site's wp-content/plugins/versionpress. Any changes you make locally are immediately live. Database can be inspected using Adminer at http://localhost:8099, server name mysql, login root / r00tpwd. You can also use tools like MySQL Workbench or mysql command-line client, e.g., mysql -u root -p.
WordPress root is mapped to ./dev-env/wp. You can use your local Git client to inspect the site's history there. 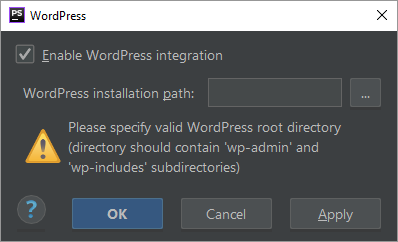 To invoke WP-CLI or Git commands in the site, create a terminal session via docker-compose exec wordpress /bin/bash or invoke the command directly, e.g., docker-compose exec wordpress git log or docker-compose exec wordpress wp option update blogname "Hello". Aliasing docker-compose to dc will save you some typing. Values in docker-compose.yml can be customized via docker-compose.override.yml. Run npm stop to stop the development environment. 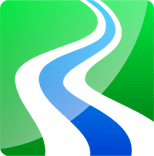 Run npm run stop-and-cleanup to also clean up WordPress files and MySQL database for a fresh start next time. 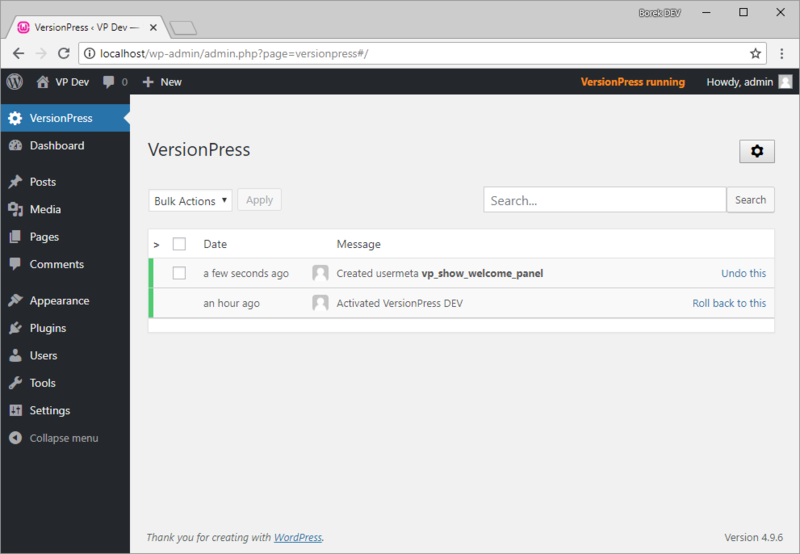 VersionPress consists of PHP code implementing the core versioning logic and a React frontend. This section is about the former, the latter is described in Frontend development below. For PHP development, we recommend PhpStorm and ship project files for it. The steps here have been tested in PhpStorm 2018.1. Run npm run init-phpstorm. 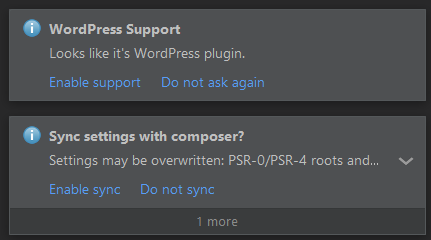 This copies .idea to plugins/versionpress. For Code Sniffer inspections to work, there's a one-time configuration: Go to Settings > Languages & Frameworks > PHP > Code Sniffer, select Local, click the three dots next to it and provide your full system path to ./vendor/bin/phpcs. Note: Most VersionPress code uses the PSR-2 coding standard with only the parts directly interacting with WordPress using WordPress conventions. For example, global functions are defined as vp_register_hooks(), not registerHooks(). It is also useful to install the EditorConfig extension, VersionPress ships with some basic formatting rules. Please refer to the Contributing code section in CONTRIBUTING.md. 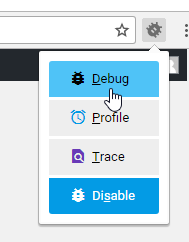 The development containers have Xdebug installed and configured. 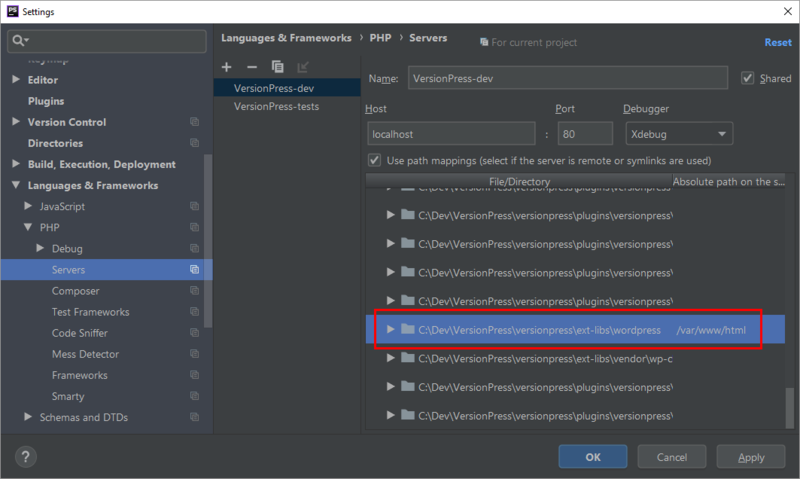 Here is how to make debugging work in PhpStorm; the Debugging tests section gives an example of how to make debugging work in VSCode. Start the Docker stack with npm start. 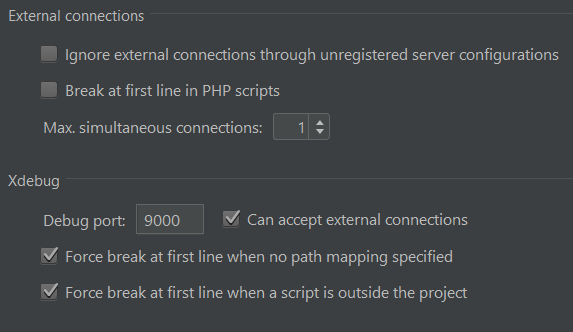 Place a breakpoint somewhere, e.g., in the main versionpress.php file, and start listening for debug connections in PhpStorm. After you're done with debugging, run npm stop or npm run stop-and-cleanup. Run npm run init-phpstorm if you haven't done that already. 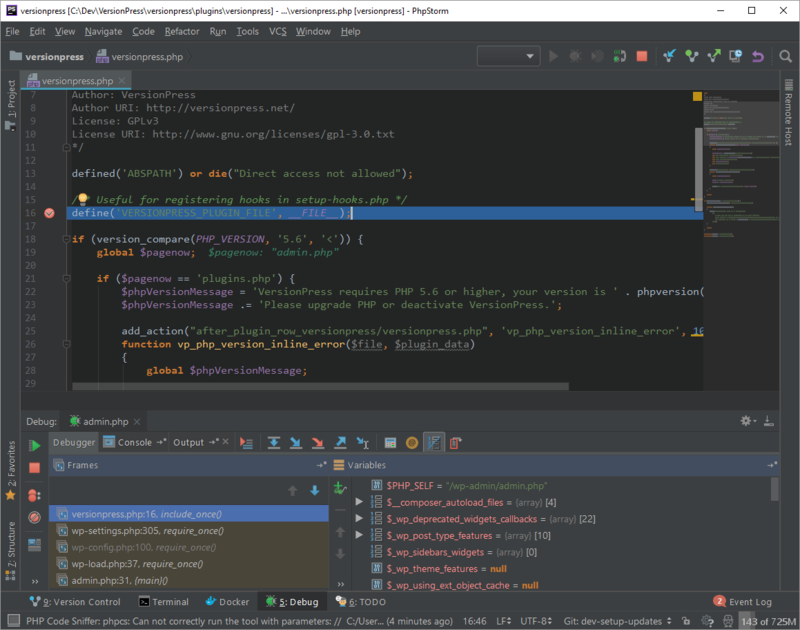 Open the frontend project in PhpStorm. Linting task is set up for the frontend project. Run npm run lint in the frontend directory. For pure frontend development, it's more convenient to run it outside of the WordPress administration. Let's assume you run the frontend against the default Docker site. 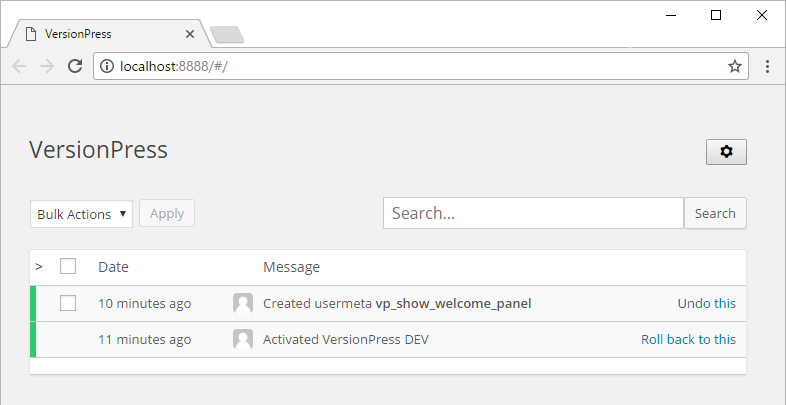 Make sure that the site is running and that VersionPress is activated in it. You should be able to visit http://localhost in the browser and the frontend/src/config/config.local.ts should contain this URL as API root. Run npm start in the frontend directory. Source code edits will be automatically reflected in the browser. Run npm run build, it will produce a file like dist/versionpress-3.0.2.zip. The version number is based on the nearest Git tag and can also be something like 3.0.2-27-g0e1ce7f meaning that the closest tag is 3.0.2, there have been 27 commits since then and the package was built from 0e1ce7f. See git describe --tags for more examples. As noted in Getting started, we only support Git Bash on Windows, a shell that comes with Git for Windows. cmd.exe or PowerShell will not work as we use Linux-style syntax (single quotes, setting environment variables, etc.) and tools like curl or rm -rf in scripts. Git Bash is generally an awesome shell, the only problems you might encounter are related to paths. For example, Docker messes with them and when you try to run docker run --rm -it ubuntu /bin/bash, you'll see an error like C:/Program Files/Git/usr/bin/bash.exe: no such file or directory. Docker prepends C:/Program Files/Git for some reason but you can use this workaround or use double slash like //bin/bash. If you can, use Docker Desktop, not Docker Toolbox. The experience will be smoother (for example, ports are forwarded by default) and also the performance is much better due to a more modern virtualization technology. You'll notice a big difference between Docker Desktop and Docker Toolbox, for example, tests run 3-4× slower in Toolbox (10 vs. 40 minutes). You might also run into various timeouts, for example, wp_remote_get() has a default timeout of 5 seconds which might not be enough. Note that it's generally hard to improve the performance of Toolbox, even if you give the virtual machine more CPUs and RAM, see these results for tests. Enable port forwarding in VirtualBox for ports 80, 3306 and 8099. If you have the repo checked out in a folder not under C:\Users\youruser, add it as a shared folder in VirtualBox settings. For example, add a share where Folder Path is C:\Projects, Folder Name is c/Projects, check both "Auto-mount" and "Make Permanent" and restart the VM. Details. Feel free to use the default Docker Quickstart Terminal: it uses Git Bash which is good. You might want to disable your antivirus software when working with Docker. Recommendations differ between version, please look it up. Meta! If you're working on updating the dev setup (this document, Docker images, etc. ), here are some tips for you. Simpler tasks are scripted directly in package.json, more complex ones in the ./scripts folder. See its README for more info. We're keeping our images close to two official ones, wordpress:php7.2-apache and wordpress:cli. The only goal of our images is to be close to the official project and have the right environment in it, e.g., the PHP version. We don't care that much about specific WordPress versions (WordPress is often installed dynamically anyway, based on test-config.yml) so we only use "vague" tags like php7.2-apache or cli.